The Philippine College of Health Sciences. Inc. (PCHS) was born on February 1, 1993, the birthday of its first President and Chief Executive Officer (CEO), Dr. George C. Cordero. The School was conceived as complimentary to Dr. Cordero’s review center, the Institute of Review and Special Studies popularly known as INRESS REVIEW Center. 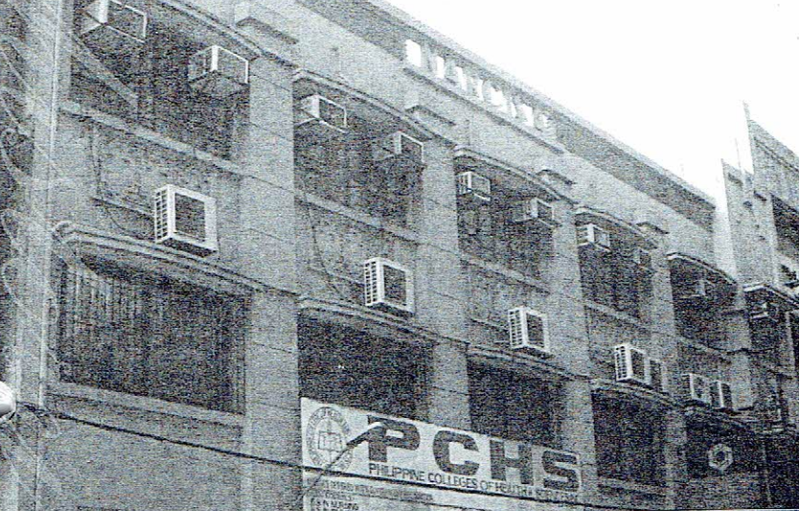 PCHS first location was a 3-story rented building with 10 classrooms in Coramina’s St. along Claro M. Recto Avenue, Manila. Dr. Cordero received his investiture as President in 1996. PCHS opened its doors on June 1994 with 124 students. The first baccalaureate courses it offered are BS in Nursing , BS in Physical Therapy, BS in Occupational Therapy, BS in Radiologic Technology and BS in Psychology, Associate in Radiologic Technology (A.R.T) and Graduate in Midwifery (G.M). Its post-graduate courses include Master of Arts in Nursing (M.A.N), Master of Arts in Education (M.A.E.d), Master of Public Administration (M.P.A), Doctor of Education (Ed.D) and Doctor of Philosophy (PhD) On the succeeding years its student population reached the one thousand mark and it almost reached the three thousand-student enrolments. As a testament to his passion and dedication in providing high quality and cost-effective education, Dr. Cordero transferred to his newly acquired building, the Doña Narcisa Building along Recto Avenue. All classrooms and offices are fully air-conditioned and with state-of-the-art laboratories, PCHS is considered young as an academic institution yet is has transformed the lives and influenced the future of thousands of students. Several PCHS students garnered top places in professional examinations and many are now occupying respectable positions in various private and government institutions both local and international.